Rough & Tumble Films is producers Justin X. Duprie and Brian Udovich. A native of Taft, TX, a fourth generation South Texas cotton farmer, and a graduate of Texas A&M University. Duprie has an unhealthy obsession with the movies The 400 Blows and Once Upon a Time in the West. Grew up in Joliet, IL and a graduate of the American Film Institute. Udovich has been a producer involved with The Wackness, A Necessary Death, South of Heaven and is returning to TIFF for the first time since premiering All The Boys Love Mandy Lane in 2006. He has watched George Miller’s The Road Warrior way too many times. With only three weeks left until his two best friends leave for college, Billy Joe robs his cotton farmer boss, Giff, in order to pay for one last blow out weekend in Corpus Christi, Texas. Upon returning, the teens are confronted by the unfortunate and brutal consequences of stealing from his boss. Now Billy Joe, Bobby, and Sue must embark on a dangerous journey that will test their trust and friendship and take them across the line from carefree adolescence into the harsh reality of adulthood. 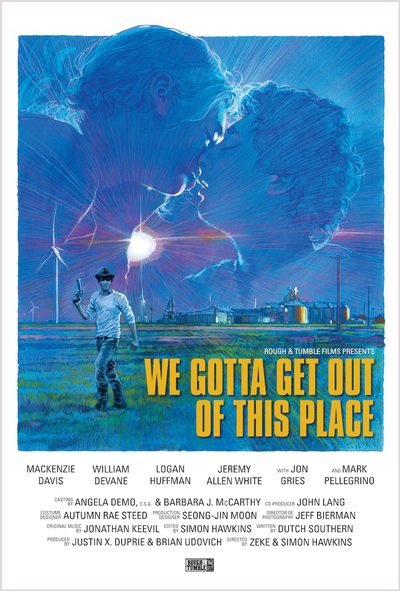 World Premiere of We Gotta Get Out Of This Place at the Toronto International Film Festival September 7, 2013. Wanna get ahold of us? Email us here.